As you all know today a large part of the population is troubled by knee pain especially in rising age. Sometimes many people do not even care about it and in the end when pain starts getting out of control,they start taking painkillers.Take a painkiller in the knee pain for a long time,Keep in mind that after some time the effect of the painkillers also ends and pain also increases.In the end the condition is so much critical and knee transplant remains the only way.So if you are troubled by knee pain,then immediately meet doctor do not become a doctor himself. 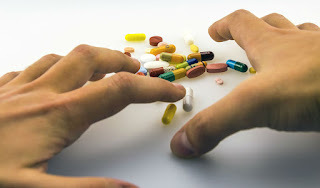 We are just saying that it is not right to start painkillers quickly in any kind of disease.First always meet a good doctor and tell your problem then take any medication.Many people are in habit,they have taken a painkiller for a long time without any doctor prescription which is not good so please stop.Usually to reduce the pain of arthritis non steroidal anti-inflammatory drugs are given,whose continuous use also damages our stomach,kidneys so do not take medicines without doctor's consultation. Use painkillers only by the advice of experienced doctor.You should not take any pan killer without eating anything on empty stomach.The use of more pen killer can also cause kidney problems. In addition, regular pen-killer medicines can increase renal problems in the long term.